Ever since I started my career in Oracle technology I’ve always wanted to deliver the best support to my clients. I have wanted to solve the problems quickly. I am not afraid of new challenges, I am not afraid to start looking into a problem that I have never seen before; on the contrary, I am happy to look into unfamiliar problems because they are opportunities to learn. Following that approach, and to comply with my commitment with my clients, I started to look into Oracle certification program. 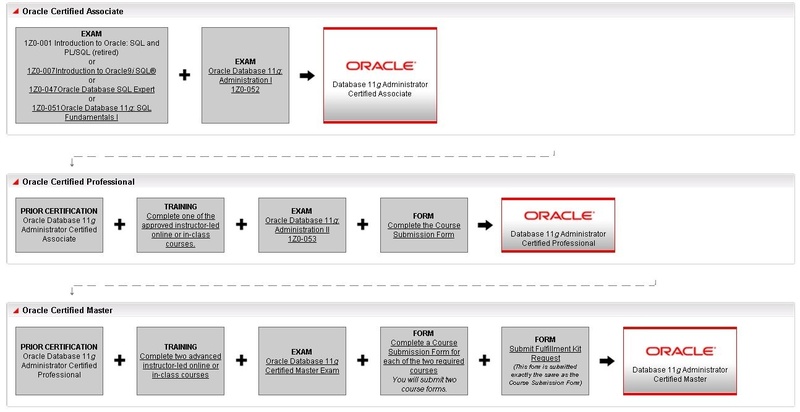 I began to learn what Oracle University was about, and the paths to get certified. I started my career with Oracle Database 11g. Then, because of the clients I was doing work for, I extended my knowledge to 10g and even 9i, and the oldest version I had was 8i but with few tickets on it. At the moment, the newest version of Oracle is 12c and all the certifications are already available for 12c. You can even get certified in a specific release, like OCP on 12cR2. I recommend that you get certified on the most recent versions of the technology you are interested. Additionally, I became an Oracle ACE in 2013 and an Oracle ACE Director in 2015. I also was a technical reviewer of the book "Oracle Database 12c Release 2 Multitenant" and a co-author of the book "Oracle Database 12c Release 2 Testing Tools and Techniques for Performance and Scalability". After all this hard work, I can tell you why certifications are important. Of course, this is a personal opinion. At the beginning of my career I started getting certifications frequently in order to get a salary hike (like the most people that are starting a career) , but after two certifications I changed my thinking and started to enjoy the path because it was aligned with what I wanted to deliver: to fix problems quickly and deliver excellence to my clients, which is the right approach. It's all about the enjoy the journey! When preparing for a certification, you have to build several environments, practice installations and different rman scenarios, test every Oracle database feature and ASM feature. You find errors, and investigate how to fix those errors. While investigating the problems you will read blogs, Metalink notes, whitepapers, Oracle Press books, Oracle University manuals and even videos on YouTube! You will spend several hours and days in front of a computer practicing. You’ll study so hard that when you are in front of the computer actually taking the exam, it’s anticlimactic – just a set of some questions that you already know how to answer. You’ll feel like it’s a time sink to sit in front of that laptop taking the exam because you already know you’ve got the knowledge. Yes, you do have the knowledge, but you still have to pass the exam to prove it. And once that certification is in hand, it is proof of all the preparation and hard work that help you deliver better support to your clients. Preparing for the exam increases your knowledge. You get faster at fixing problems. You face several issues while practicing that sometimes only with "hear" or "see" the symptoms you already know where the problem would be. You acquire friends and colleagues through forums, blogs and Oracle events around the world. You can get better jobs. You can deliver your clients a better quality of support. Depending on where you are, yes, you may get that pay raise. If you become an OCM you also get a special profile in Oracle OCMs list. You get less stressed, because with the knowledge you’ve acquired preparing for certification there will be fewer things that you don’t know, and less reason to fear making errors. Since your knowledge has increased, you also can help your colleagues. Companies promote your certifications to prove that they have good consultants. For partnerships, When you are looking for being a partner of another company, the other company will look into your consultants and their certifications. Companies use your certifications to prove that they can work with a specific technology or product very well (Amazon AWS, Oracle DB, Tuning, SOA, etc.). It’s better to hire certified consultants where the risk that they make mistakes is less than a consultant that doesn’t have certifications. Of course there are also consultants without certifications with a lot of experience, but in those cases, they have to demonstrate that experience from past performance unless the person is well-known and is very well-recommended by others that we already know. Companies can charge a higher hourly rate for support or consulting when the consultants are certified. Having several certified consultants is very helpful when the company wants to get on board with a big prospective customer or get a very good contract. Generally large enterprises want companies with certified consultants to provide them services. Having certified consultants helps a firm compete with other companies in the same industry. In Guatemala, for example, the country where I am currently living, I have observed that certifications are more important to hiring companies in the IT industry than a bachelor’s degree. For non-IT companies, it may be different, but in Latin American IT companies this is common. And over the years I have seen many students starting early in their college years and getting certified to increase their expertise in a single technology (Let's say Java, etc). I’m included in this group, because I started working with Oracle technology professionally before completing university. IT industry wants people very specialized in a single technology or product and ready to get involved in projects. Certifications are important for consultants and also for the companies to we work for. The industry wants specialized people. The IT industry is growing fast, with some of the largest companies in the world today being in IT, and they’re demanding certified people. This is an opportunity that you have to take advantage of: Get certified!